Post your Sunday School cooking lessons, ideas, activities, and resources for the Lord's Prayer. Bible lessons and ideas about the Lord's Prayer -with Cooking, Food, Bible Foods, Recipes, Baking, Preparation, etc. Learn about the four types of prayer using the "A.C.T.S. prayer: Adore, Confess, Thanksgiving, Supplication. You will take colored ribbons (or beaded leather prayer ropes) to represent each of the four letters in A.C.T.S. and wave which ribbon they think each line of the Lord Prayer represents. You will make prayer rolls - roll dough into the four letters ACTS and bake. Select one color of ribbon, write or draw a prayer on it and hang on prayer tree. Note: You can substitute a number of different types of bread/rolls/cinnamon rolls, as long as they can be baked into the shape of letters. You can make one BIG "ACTS" roll for the entire class, and let each student also make a smaller one to take home and share. See the adaptation note below for shorter baking times. Why do you think it’s called the LORD’s prayer? Call their attention to the ‘Lord’s Prayer’ poster. Read it all together as a group. Say: This prayer that Jesus taught his followers had all the ingredients of a great prayer. Speaking of ingredients …. We’re going to be making “Prayer Bread”. What do you think Prayer Bread looks like? What do you think it tastes like? There are 4 kinds of prayers and you’ll each make 4 pieces to our “prayer bread”. Can you name one kind of prayer? Instead of Ribbons, you can have leather rope and have the kids make a prayer bracelet or door hanger that has four different colors of beads on it. Say: The Lord’s Prayer has all 4 of these ingredients. I’ve matched a color to each of the types of prayer. Turn over the poster of the Lord’s prayer and show the colors and the types of prayer. Have kids each choose one colored ribbon. Say: After I read each line of the Lord’s Prayer, I’ll pause. You decide which type of prayer that line is and wave the matching color ribbon if you have it. Read each line of the Lord’s Prayer as follows, pausing after each line. The corresponding color is shown and if they hesitate, you can read the explanation which follows in italics. Reminder: You can substitute a number of different types of bread/rolls/cinnamon rolls, as long as they can be baked into the shape of letters. Have kids wash their hands Assemble the kids around the 2 tables (standing – don’t use chairs). Put a plastic tablecloth on each table. Open a roll of 10-count canned biscuits. Give each child one biscuit and a plastic knife. Tell them to cut their biscuit into 4 pieces – one cut across and one down. Tell them that these 4 pieces represent the 4 types of prayer. There will be a sugar and cinnamon mixture that you will pour into a small bowl to be shared between 2-3 kids. Say: Gently roll one of biscuits piece into a ball. This represents A, Adoration, prayers of praise to God. Roll it in the bowl of sugar and cinnamon to completely coat it. As you roll it around, say a silent prayer to God of Adoration. As they do this, lightly spray a round pan with ‘Pam’. Place on the table. When the kids have finished their Adoration prayer, have them place their little rolled biscuit in the pan. Say: Now take your second biscuit piece and do the same thing, but this one represents C – Confession. Gently roll it into a ball, then roll it in the sugar/cinnamon and pray a silent prayer of confession for something you’ve done that you need to ask God for forgiveness for. Remember that if it’s something you’ve hurt not only God by doing, but also someone else, then you also need to ask that person for forgiveness, too. Also if someone is sincere and asks for your forgiveness for something they’ve done to you, we should forgive. That’s what the line of the Lord’s prayer means that says: Forgive us our debts, as we forgive our debtors. They will place this ball in the pan also. They’ll make one layer, then if/when the bottom of the pan is covered, they’ll start a second layer. Third ball: repeat the process asking what the next letter is – T – and what it stands for – Thanksgiving. Silently pray a prayer of thanks. When their last biscuit ball is in the pan, have the kids wash up while you pour a stick of melted margarine over the biscuits. Then sprinkle some of the cinnamon/sugar mixture over it. Bake for 30 minutes at 350 degrees. Watch closely. After kids have washed up, have them sit in a half circle. Ask: So what exactly is ‘prayer’? Prayer is talking to God. But when we pray we’re not supposed to be looking out for our own wants and needs, we’re supposed to be praying with God’s Eyes --- any guesses what that might mean? We want our world to be like God wants it to be. We want ourselves to behave like God wants us to behave. We want to be like Jesus because that’s who God wants us to be like! Prayer is asking and working for God’s kingdom and God’s rules to come and happen now. Explain: The hanging of prayer ribbons on trees is known in many cultures and has been adopted by many churches. What does the American tradition of hanging a red, white & blue ribbon mean? (That we’re proud of our country) What does hanging a yellow ribbon mean? (That we have hope for someone to return home, whether it’s someone who has gone off to fight in a war or someone who is lost). Say: We’re going to each choose one color of ribbon, based on the ACTS prayer (show poster with ACTS and colors) of a prayer that we want to pray and then write (or for youngest kids – draw a picture) that prayer. Using ink pens have them write their prayer on their ribbon. Then help them tie it to the artificial “prayer tree” in the courtyard outside the Fireside Room door. Let the kids know that others in the congregation will be encouraged to add to the prayer tree, too, and then should tell their parents to add to it. Don’t let brothers or sisters who are part of the LIGHT know yet though because they’ll be doing it with their group another Sunday. God, thank you for being someone we can talk to. You know what makes us happy and what makes us sad. You know what each person in this class has put on our prayer tree. Please answer these prayers in a way that will help us. And all God’s kids said, Amen! After the bread has baked, you’ll flop it out of the pan onto a plate. Then after it cools a bit have the kids break off pieces to eat and enjoy. While they eat, let their ‘shepherd’ have some time to do wrap up/reflection with them. This cooking lesson worked very well for all ages from preschool through 5th grade. I like this idea of making prayer bread and the connection with the ACTS. However, our workshop time would not allow time to prepare, cook, and eat this in 45 minutes. So, I started modifying and came up with the idea of putting the four pieces in paper-lined muffin tins. The cooking time is reduced down to about 10 minutes. The other bonuses are that the four pieces are still obvious after cooking, each child can be served on their paper liner, and cleanup is much easier. Alternately, you can make the letters VERY THIN, like Bread Sticks. They will cook a lot quicker. with the prayerreminders so the kids can try making it at home. biscuit into quarters. Roll each biscuit piece in cinnamon and sugar. 2 minutes. Turn upside down on serving plate and serve. children will learn the four parts of prayers during the creation of making prayer pretzels in the shape of the letters ACTS (adoration, confession, thanksgiving, supplication). To learn that Jesus modeled how we should pray. To learn that prayer is essential in one’s spiritual journey. To learn that there are different kinds of prayer, and that all kinds are important. To learn that we communicate to God through prayer, believing that he hears our prayers and answers them in His time. Children will learn about different kinds of prayers. Children will make prayer pretzels in the shape of ACTS letters. Children will learn that prayer nourishes our soul, just as food nourishes our body. There is more than one way to pray. Direct kids to wash their hands and to find a spot at one of the tables. You respect them, they have a special place in your heart. Then they will brush egg over their pretzel and add the topping of their choice. Our family, food, shelter, friends, etc. God doesn’t want us to pray with a wish list. On the wax paper, label which pretzels belong to which kid. Bake pretzels in the convection over for 13-15 minutes at 350 degrees. Instruct kids to clean-up their area and transition to the Temple Courtyard. Ask: “What are the four kinds of prayer? Toss the green Life-Application Ball around for a few seconds. Whoever catches the ball will need to choose one of the prompts underneath their thumbs. The whole class will then discuss how the Bible Point can be applied in their lives. Bible Point: There is more than one way to pray. End the workshop by practicing the different kinds of prayers. Depending on kids’ comfort levels, they can pray these prayers silently or out loud. 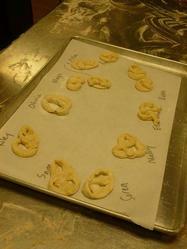 Using Bread Stick dough, make "prayer pretzels" and write "sentence" prayers to be used in an upcoming worship service. Name that the story is found in the New Testament. Identify the four Gospels. For 3rd grade and up: Locate the story. Define prayer as a means of growing a personal relationship with God: talking and listening to God – anytime, any place, and about anything. Retell the story in his/her own words of the disciples asking Jesus to teach them to pray, and Jesus’ response, known as the Lord’s Prayer. Describe the Lord’s Prayer as universal, spoken in languages around the world, uniting Christians in their faith. Discuss the meaning of portions of the Lord’s Prayer. Using modern translations of the Bible (such as The Message or The Voice) come up with a rap version of the Lord's Prayer. (Link to four "modern" versions of Matt 6:9-15). For example: "Give us each day that day’s bread—no more, no less." Write in large letters, the Lord’s Prayer on a piece(s) of easel paper and post it on the wall where it can be seen. Highlight the phrase: “Give us this day our daily bread." 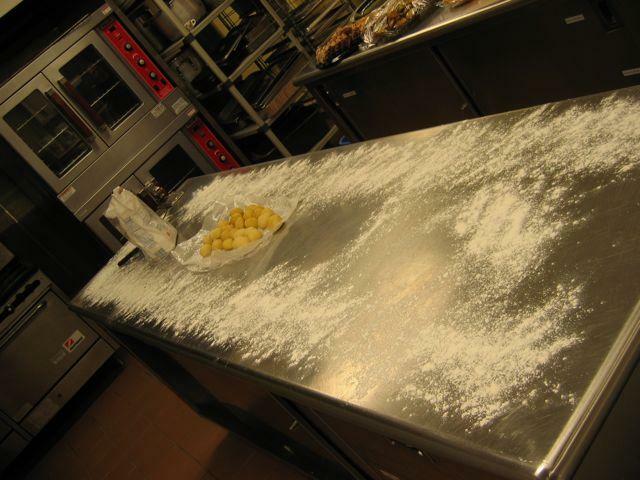 Pre-dusting work areas with flour is a good idea! Kids are ready to dive right in with the pretzel forming. When 3rd grade and up will visit, distribute Bibles around the tables. Cover two large cookie sheets with parchment paper. Dust an appropriate number of work areas on the metal table(s) with flour. (See photo on the right). Greet your students warmly, welcoming them to the Cooking Workshop. Introduce yourself and any other adults. Say: This month we are learning about the Lord’s Prayer. Today we are going to be making a type of bread. Ask: I am wondering how break ties into the Lord’s Prayer. Say: That's right! The Lord's Prayer mentions bread: "Give us this day our daily bread." (Refer to the highlighted easel paper.) Today we are going to make a type of bread – we'll be making pretzels. I'm sure you'll be surprised to learn, pretzels have a tie to prayer! First, let’s start with prayer. Ask for any prayer requests. [It is ok to write them down.] Ask if anyone would like to help lead the prayer or perhaps the Lord's Prayer at the end. A prayer suggestion: Holy Lord God, we are thankful to be here today gathered in your name, to learn and to experience your love for us. (Pray for requests.) Help us to be open to opportunities to work at becoming friends with you. (End with the Lord’s Prayer) Amen. Say: In a little while, we’ll have a chance to write down or to dictate to an adult, what we call sentence prayers; prayers that are short and are only one sentence long. Ask: Does anyone know who first wrote down the Lord’s Prayer? Say: Jesus was the one who first spoke what we now call the Lord’s Prayer, but it was written down for us to read by some followers of Jesus named Matthew and Luke. Matthew and Luke wrote about a time when Jesus taught his disciples how to pray. Say: That’s right, those are the names of two of books of the Bible. Do: Make sure that everyone has access to a Bible. Review the quick way to find the New Testament: Opening the Bible in middle lands you usually in Psalms. Taking just the back half and finding middle of that, gets you to beginning of the New Testament. Have everyone find Luke 11:1. Ask a student to read verse one. Say: Perhaps they were confused about how to pray. Say: Even though these are both stories about the Lord’s Prayer, Matthew and Luke tell the story differently. Some time this week sit down with your family and compare the two tellings of this story. In Luke, just before Jesus teaches the disciples how to pray, he had been talking about how not to pray. Say: Jesus was talking about people who were praying just to show off; so that their friends would see them praying and think that they were close to God. That is not what Jesus teaches. Do: Have students find Matthew 6:9 and read verses 9 - 11. Ask: Do you recognize the Lord’s Prayer? Say: I'm going to say a version of the Lord's Prayer in a way you may not have heard before. When Jesus first taught the disciples how to pray, he didn’t use this method, but I’ll bet that Jesus would like this. Do: Say the Lord's Prayer in rap. Say: That was like a rap wasn’t it? Do: Have students repeat the part about daily bread. Say: Let’s make a type of daily bread – pretzels. Ask: Does anyone know the story of how the pretzel was invented? Say: Pretzels had their beginning about 1,400 years ago. At that time, during Lent, which is the time before Easter, Christians would give up eating milk and butter. So the type of bread they would eat during Lent was just made out of flour, water and salt. The story is that a monk (a religious person) was making this special bread for Lent and decided to shape the dough to represent someone praying. People often prayed at that time, with their arms folded across their chests, each hand on the opposite shoulder. Ask: Do my arms look like a pretzel shape? Say: It occurred to this monk that he could twist bread dough into this shape and use it as a treat for any children who learned to recite their prayers. Now whenever you eat a pretzel you can think about prayer! Let’s make some pretzels and talk more about prayer. Have everyone wash their hands. Open the packages of bread stick dough. Have kids help you separate the dough into 12 sticks per package. Roll each individual stick of dough into a rope about 15 inches long. This can be done right on the metal tabletop in the floured areas. When the first person has a rope ready, stop everyone and give a lesson in making a pretzel shape. Say: Bring the ends of the rope up and cross them over each other twice. Pull the twisted ends down and seal tightly. Ask: Does it look like arms folded in prayer? 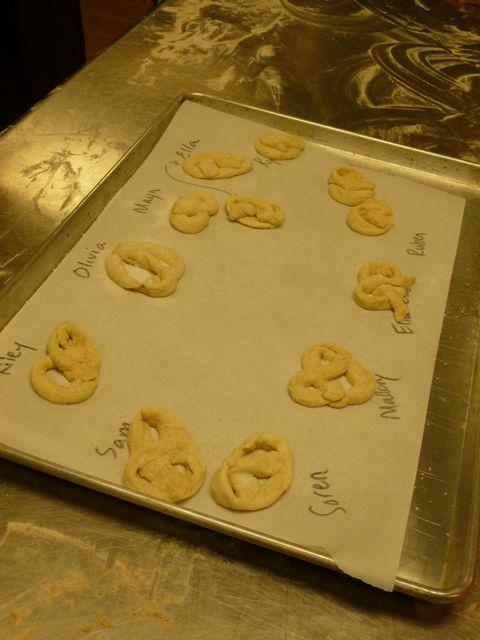 Have everyone create two pretzels and place on parchment-covered baking sheets. Sprinkle lightly with Kosher Salt. Bake at 375 for 13-15 minutes. Ask the Shepherd to time the pretzels. When they are done, allow them to cool for a few minutes on the cookie sheets and then bring them to the students. Say: Prayer is talking and listening to God. We can pray to God any time, any place and about everything. Say: God would really like to be your best friend. Ask: Have you recently met some new people, as school has just started? How can these new people become your friends? Say: We become friends with someone by talking to them, by getting to know them and by including them in our daily lives. It works the same way with God! Prayer helps you to include God in your life. Say: We can pray to God about everything! God wants very much to hear what is on our minds, whether it is things we are worried about or things for which we are thankful. God loves to hear us talk to him either out loud, or silently in our heads. We can talk to God any time and any place. Ask: Part of the Lord’s Prayer says: Give us this day our daily bread. What do you suppose that means? Why “bread” and not something else - why not give us this day our daily cheeseburger? Say: Bread is something that is eaten in different forms all over the world. Give us this day our daily bread reminds us that each day we must come to God trusting for that day’snourishment. God takes care of us one day at a time. Say: In worship we say the Lord’s Prayer and we sometimes say what are called responsive prayers, where a leader prays something and everyone responds with something like: “Lord, hear our prayer.” There is a special worship service planned soon and we have been asked to help write a prayer. I thought it would be best if we wrote sentence prayers; short prayers that are one sentence long. Say: We can pray to God with our arms shaped like a pretzel or with our hands in the air, or just by looking “normal;” eyes open or eyes closed. God hears our prayers no matter what position we are in or what words we use. We also can be very glad to have special prayers that we can say, such as the Lord’s Prayer, when we gather together. The Lord’s Prayer is also prayed in churches all around the world! This is a very good prayer to learn by heart because Christians pray it everywhere. What are some things that you might pray for every day? Why would Jesus teach us to pray for our needs? Use the "Prayer Sandwich" described below. I made a “sandwich” out of different colors of Foamie Sheets. I did get creative and cut holes in the “cheese” and drew seeds on the “tomato”. I glued words on each part of the sandwich ingredients as listed below. One side of each piece had the words of the Lord’s Prayer. Other side had interpretations. The kids put the sandwich together in the correct order. We then talked about how prayer has different ingredients. You are holy God. We call you Father because you love us like a father. “Thy kingdom come. Thy will be done on earth as it is in heaven. May what you want God, be done here in our daily lives. We trust you God to give us each day the food and other things we need to live. Forgive us and help us to forgive others. Do not let anything cause us to do wrong. Keep us safe from our own weaknesses and poor choices. 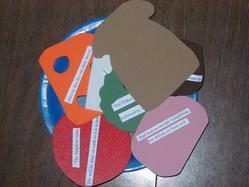 Children will make a paper salad using colors to represent parts of the Lord’s Prayer. Children will try some real ingredients for salads. This lesson skews towards younger children. You might adapt it up for older by substituting all real ingredients. deepen their understanding of the Lord’s Prayer through the definitions provided with the different colors. understand that prayer nourishes our relationship with God just as food nourishes our bodies. Ask: Who likes to eat? What do you like to eat? Do you ever eat fruits or vegetables? What kind of fruits or vegetables do you like to eat. Do you know one reason I like vegetables so much? Because they are all different colors. There are so many different colors that they remind me of the Lord’s Prayer when I see them. Have the kids turn to Matthew 6:5-15. Read up to verse 9. Say: This is called “The Lord’s Prayer”. God used Matthew to write it down so that we can remember the way Jesus taught us to pray and to include the things that are important when we pray. Read the rest of the verses. You may want to read a more traditional version (KJV or NKJV) and compare the wording. Gather the kids around the table with items for salad. Have ‘white’ item out. Point out the different colors. Let them taste whichever items they would like. Tell them how foods like these are helpful to our bodies, keeping us strong and healthy. Say: Just as fruits and vegetables help our physical bodies, praying helps keep our spirit healthy by staying close to God through spending time with him. Say: All these colors remind me of the Lord’s Prayer. Let’s look at them in a different way. This will help us remember the Lord’s Prayer. As we also have forgiven our debtors - (pink, love – pink. Forgiveness is key in showing love to our neighbor. As you go through the list on the handout have the kids point to items that represent the color you are talking about. Move over to where the paper is if it isn’t cut up have the kids help cut the color paper into the bowl as you talk about it. If it is cut up have the kids put the color paper in at the correct time. Start with mentioning the napkin, or bowl, whatever is white; then move down the list. When you finish, give the kids a baggie and let them put some paper salad in. Add a paper with the descriptions on it and send it home with them. You may offer some of the real food if you choose. Explain to the kids how important it is to have a prayer routine. They need to have a set time of day to pray and a special place where they won’t be interrupted. Discuss the different parts of prayer (A.C.T.S. - Adoration, Confession, Thanksgiving, Supplication) Explain that when we pray to help someone else, when we step in to tell God about another person’s need, that is a prayer called intercessory prayer. Like when we pray for our mommy to have a good day or for our daddy to be safe at work, that is an intercessory prayer. Say the Lord’s Prayer as a group. Have the kids help clean up. Have kids reflect on where and when they can take time to pray and talk to God. Let them write it or draw them praying in their special place. Optional: use an activity page. Amazing resource of the Lords prayer. I myself learnt so many things. May God bless your work.